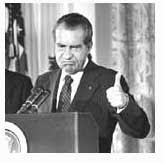 This week, President Obama passes Richard Nixon on the slowest president to grant a single pardon list. In two and a quarter centuries, only four presidents have been slower than Obama: George Washington (1789-1797), John Adams (1797-1801), Bill Clinton (1993-2000) and George W. Bush (2000-2009). See chart here. Obama will move past John Adams, into third place, in 250 days. The major difference between the Obama administration and the administrations before is the record number of pardon and commutation applications that are sitting in the Department of Justice and the Office of the Pardon Attorney.